just a quiet morning at the park . . . Taking a lakeside stroll . . .
watching the workers . . . These guys reminded us of The Ugly Duckling. They looked like they were getting along swimmingly though . . .
1. All the area schools were closed because it was SO cold. So no preschool for Ivo and no work for Josh -- yippeee! Josh said it was 23 below, but I wouldn't get out of bed to see for myself because of surprise number 2 . . .
2. The furnace was broken! Yikes were we ever shivering. Luckily our landlord came over right away with some workers and had the ol' girl running again before noon. Again, yippeee! These are the times I love being a renter. In the meantime, to keep warm I decided to turn on the oven and make a nice coffee cake. Here is my recipe: Buy a box of coffee cake mix and follow the directions on the package. Krusteaz Cinnamon Crumb Cake did us all a little justice and turned the morning from cold to cozy. Between the three of us and the two workers, we finished off the whole thing, yum! Now Ivo and Josh are in the middle of a game of Mille Bornes, the house is warm and snug and I'm about to curl up with one of my new library books and just relax and enjoy the gift of a winters day like this with no place to go. And my hat is off to the furnace repair workers of the world, my new heroes! Josh found this old version of the French card game Mille Bornes at our local thrift store, and since I am notoriously impatient with card games he decided to teach Ivo how to play instead of me. Ivo was immediately interested because of the cards themselves, showing things like flat tires, firetrucks, and mechanics in jumpsuits tinkering under the hoods of little French voitures. And to my amazement he eagerly learned how to play, following most of the rules most of the time (like his mom). He loves counting up his miles and especially loves shouting "Coup-Fourre!" His only real problem with the game is that he wants it to be more cooperative. Like when Josh plays a Creve card to give me a flat tire, Ivo will just reach over with a Roue de Secours and say, "It's ok mama, you can have one of my new tires." He's about as competitive as his parents, which is to say, not very. But that's ok because it makes family game night a strictly tear-free, no-drama event. Winners and losers aside, we're really all just in it for the giggles and the popcorn. etsy christmas shopping . 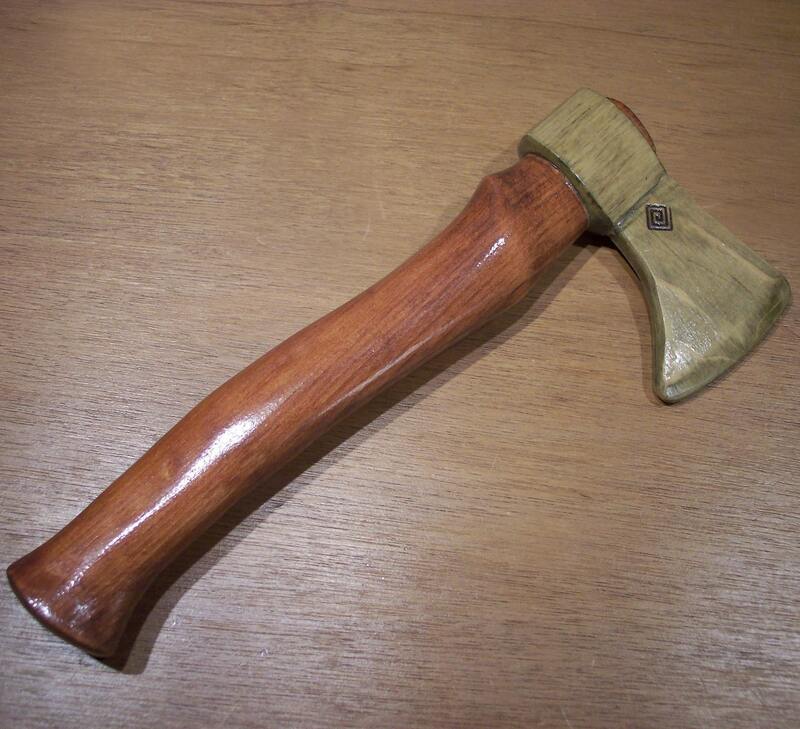 . .
A wooden axe from Friendly Fairies. It's one of those gifts that I cannot wait to give because it is so perfectly right for him. I can just imagine all of the chop-chop-chopping he will do. So many of his favorite stories feature axe-chopping scenes: Jack and the Beanstalk, Little Red Riding Hood, the Woodcutter and His Wife, I'm sure there are even more. And any time Josh has to chop wood or use his hatchet Ivo begs for a try of it. So now he can chop to his little heart's content and still keep all of his fingers. Hooray for finding the perfect gift! To see an uplifting video message from children around the world, click here. I hope everyone has a wonderful Veterans Day and can find some time for reflection on this day's message of world peace. The Blue Hills have been a leaf wonderland ever since we arrived. The past couple of days brought enough wind and rain to finish off most of the trees and take the cornflake-crunch out of the leaves on the ground, but not before we had lots of fall fun. Ivo and Josh spent almost a whole day building a debris hut by Uncle Sam's house. It doesn't look like much more than a pile of leaves in the photo, but if you click on the link you can see all the steps that went into building it. Josh likes to sleep in a natural shelter when he goes camping or backpacking. I do not. I like to stay at a Holiday Inn. (We compromise with a tent.) Ivo takes after his dad of course and was very excited by the prospect of spending the night in the debris hut. He even said, "And Mama you can sleep in it too! With me and Josh in the leaves!" I told Josh I was afraid that Ivo, being so little, would drown in the leaves during the night. Yeah he thinks I'm nuts. But he knows I wouldn't sleep a wink knowing my sweet baby was under a pile of leaves deep in bear country, so he didn't press the issue. Old spoilsport mama. Today the boys are headed out to explore the woods, and I'm going to scout around the quilting shop down the block from our new house. I didn't even know it was there until I did a google search for fabric shops in our area of the state, and the first hit that popped up was right in our neighborhood. They even specialize in Janome sewing machines. Josh saw the website, read about the 4,000 bolts of quilt fabric and said, "This looks like trouble!" I told him he and Ivo can build an inside debris hut with my scraps. And sleep in it too. Josh and Ivo are out fishing today, they took the canoe out this morning and with any luck at all we should be having a shore lunch supper tonight, yum yum. If the fish are the lucky ones, I have a pizza in the freezer. No worries! I'm just glad for the peace and quiet of an empty house, especially since I know my two dudes are out doing what they love best--yukking it up in the canoe, stomping through the woods, and goofing around in general. Hurray for Saturday, Dad-urday!